Although the Democratic and Republican parties in the United States currently seem extremely polarized, they did not start out that way. In fact, these two parties originated as one, single party. This party was called the Democratic-Republican Party, and it was organized by James Madison and Thomas Jefferson in 1791. The purpose of the Democratic-Republican Party was to stand in opposition against the Federalist Party in upcoming elections. The Democratic-Republican Party supported states’ rights and the literal and strict interpretation of the Constitution. They also prioritized financial and legislative support of family-based agriculture. Due to immense fear toward anything that resembled England’s monarchy, Democratic-Republicans contested elitism. They despised and feared the Federalists, who were extremely wealthy aristocrats that wanted to create a national bank and emphasize the power of the national government rather than state governments. The Democratic-Republican party strove to prevent the United States government from becoming too similar to a monarchy. Because of the widespread fear of monarchy among workers and farmers, the popularity of the party increased throughout the 1790s. In the election of 1801, Thomas Jefferson was voted into office, bringing the Democratic-Republican Party to power. After the War of 1812, the Federalist Party lost most of its support and disbanded, leaving the Democratic-Republican Party without opposition. From 1815 to 1832, the organization of the Democratic-Republican Party faltered. Without the pressure of competition, they no longer needed a united front. States began nominating local electors, who had their own personal interests in mind. This split up the party several different ways. Particularly the split led to, in 1828, the modern Democratic Party, along with another political party known as the Whig Party. The Democratic Party—led by Andrew Jackson and Martin Van Buren—was made up of farmers, urban laborers, and Irish Catholics. Although the Democratic Party was not exactly popular in most New England states, it gained immense popularity in New York, Pennsylvania, Virginia, and western states. Democrats at this time strongly opposed aristocracy, a national bank, and programs which pushed to modernize American industry instead of family-based agriculture. Additionally, they supported the Mexican-American War and the expansion of farmland into the western territories. They also opposed anti-immigration legislation and monopolies. Although the Democratic Party was much more popular in comparison with the Whig Party, the Whigs had access to more wealth, and thus more funding and influence. In 1848, the Democratic National Committee was created at the elector nomination convention. General Lewis Cass was nominated for candidacy, but he lost the election to a Whig named General Zachary Taylor. The outcome of the election was greatly influenced by the Free Soil Party of New York. The Free Soil Party was established for one reason—to oppose the expansion of slavery into the new western states. The Free Soil Party was made up of members from both the Whig Party and the Democratic Party who felt that free men on free soil should remain free. They also fought for the rights of free men in many Midwest and northern states. Because of the party division over this issue, many Democrats voted for General Taylor instead of General Cass, which greatly contributed to the loss of the Democratic Party in the election of 1848. In 1850, Democratic members of Congress passed what is known as the Compromise of 1850, which was a set of bills that attempted to prevent civil war over slavery. The Compromise essentially outlawed slavery in the Western states; however, it also included a bill called the Fugitive Slave Act of 1850, which demanded that slaves who ran away to northern states be returned to their “masters” in the South. After the Compromise of 1850, Democrats gained small increments of popularity, while the Whig Party began to lose its unity. The Whig Party became more and more divided over the issues of slavery and anti-immigration. In 1852, the Whig Party disbanded, leaving weak opposition against the Democrats for that year’s election. Democrat Franklin Pierce was elected, followed by James Buchanan in 1856. Democrats who opposed slavery eventually left the party and joined those who were left-over from the Whig Party in the North to form the Republican Party in 1854. From 1840 through 1850, certain Democrats began supporting the reform and modernization of industry. They argued that modernization would pave an easy way for farmers to market and sell their goods. Although this stance may seem drastically different from the original Democratic vision, these Democrats argued that it still supported the same goals because industrialization would indirectly lead to prosperity among farmers and laborers. By the election of 1860, the anti-slavery Republican Party gained widespread popularity. Throughout the election, the Republican Party focused on the issue of slavery. They felt that the slaveholders and slavery-supporters had taken over the government, and that these pro-slavery Democrats were voting against the progress of liberty. This incredibly powerful message led to the election of Republican Abraham Lincoln in 1860, who was as you may have deduced, the first Republican President. After the onset of the Civil War, the Northern Democrats were divided into two factions based upon support for Lincoln’s military policies: the War Democrats, who supported them, and the Copperheads, who opposed them. To prevent conflict that would injure wartime unity, no party politics were allowed in the Confederacy during the Civil War. Confederates viewed political parties as bad for governance, so they avoided political division as much as possible. In general, Northern Democrats largely supported Lincoln throughout the war; however, Democratic support began to drop off after two key events. Around the year 1862, an anti-war push for peace gained strength among the Democrats. The Copperheads especially wanted to focus on ending the war as soon as possible. The Democrats went on to lose the election of 1864 after running their candidate, George McClellan, on a peace platform, despite the majority of the War Democrats supporting Lincoln. In the congressional elections of 1866, the Radical Republicans won enough seats to have a two-thirds majority in both houses of Congress. The Republicans essentially controlled all reconstruction policies since the Democrats had so few votes. In response to this political helplessness, the Democratic Party tried a “New Departure”. The aim of the New Departure was to downplay the war. The Democrats attempted to distance themselves from the pro-slavery stance. Although the Democrats wanted to disassociate themselves from the pro-slavery stance, they did gain voter support from white Southerners who felt hostile toward the Republican Party because of the war. In 1873, the country experienced an economic depression. This allowed the democrats to win back the House in 1874; however, they would not win another presidential election until Grover Cleveland was elected in 1884. President Cleveland was the leader of a Democratic faction known as the Bourbon Democrats. The Bourbon Democrats opposed the annexation of Hawaii as well as Bimetallism, corruption of city bosses, imperialism, and US overseas expansion. They fought for and supported banking, railroad building, the Civil Service Reform, and laissez-faire capitalism. In 1893, an economic depression known as the Panic of 1893 hit due to the collapse of railroad overbuilding and under-financing. Because the Bourbon Democrats pushed railroad building, they were blamed. In 1894, the Republicans took full control of the House. Another factor that contributed to the evolution of the Democratic Party was religious affiliation. The Republicans of the North were mostly Presbyterian, Methodist, and Congregationalist, while most Democrats were Catholic, Episcopalian, and German Lutheran. Because of this sharp division, issues like prohibition became difficult to settle. 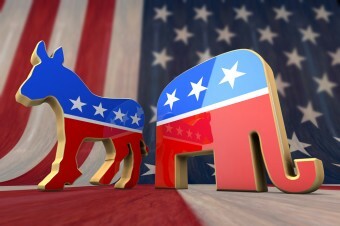 Similar to the current political atmosphere, the Republicans felt that the government should interfere with morality issues (like drinking alcohol, for example) to protect citizens from sin, while Democrats felt that the government should not be allowed to make religious or moral legislation. Over the next century, the Democratic and Republican parties began to materialize into the polarized, two-party system that we have today. Although some qualities (such as general moral stance and socioeconomic status) can be traced back to the origin of each party, other traits (like economic view and stance on government power) have changed drastically. In certain cases, the parties have flip-flopped completely. Despite the increasingly cutting tension that is growing between the Democrats and Republicans of today, it’s important to remember that our factions sprouted from the same political party and thus, a shared purpose—to create a government that is run for and by its citizens. OK but when did the democratic-republican party breakup? Since the Republicans led the fight for the freedom of the slaves, does that mean that the democrats weren’t for freeing the slaves? Absolutely. Democrats were, first, pro-slavery, and once the Republicans freed the slaves (over many of the Democrat’s dead bodies), then the surviving Democrats turned to racism/ white supremacy to deny Blacks their civil rights, even after the Republicans voted in a US Constitutional amendment to give them full citizenship and the right to vote. That’s exactly why the Democrats founded the KKK, in fact. Why did the party need to gain opposition? Couldn’t they have just stayed together and beat out any other challenging parties? It is also funny that they did not include the fact the democrat party created the KKK, supported and enforced jim crow laws, and voted against the 13th,14th and 15th amendments. True enough some confederates gave up hope and joined the republican party but no party will ever be more entwined with the confederates than the democrats, especially nowadays when their dependency/socialist agenda is clearly one of slavery, suffice to say the democrats now have more slaves than they ever dreamed of, and it will take more than another bloody war to erase them again. While the republicans oppose unions, labor laws and living wages so we are all slaves to our employers. Such baseless revisionism boggles the mind. History is meaningless without context thus your post is simply partisan political propaganda. Wouldn’t they really be more like the elitist Whigs who wanted the federal government to make decisions for the whole country? Not only is it funny, I find you quite hilarious. The Republican party back then were the liberals and the Democrats the conservatives preaching hate against those who are different from the majority as their primary doctrine. Now it’s switched. Rebecca, your comment simply isn’t true. The republicans were not what is called liberal today… and the word conservative doesn’t mean a person/party who”preaches hate against those who are different from the minority”. If you are a young adult I can understand why you think this as that is the mantra that is being repeated in classroom after classroom from K on up but it simply isn’t true. There is much to be said on this topic but I will leave it at that. Rebecca is quite right. The anti slavery movement, and the opposition to the expansion of slavery, were a big part of why Republican party formed in the first place. “Democrats who opposed slavery eventually left the party and joined those who were left-over from the Whig Party in the North to form the Republican Party in 1854.” That zeal for social change was most certainly a liberalising force in the social realm, the Republicans then, were liberal. The Democrats wanted to hold on to the status quo, they were conservatives. Obviously, and of course, there is more to be said about the issue. “Conservatives” today believe in strict interpretation of the Constitution, anti-federal control, anti national Bank, states rights, power to people. They are closer to classical liberals. They follow in the anti fed footsteps of Jefferson and Jackson. “Progressives/Liberals” today are the opposite. They seek to expand federal control, anti states rights, pro national bank and a loose interpretation of the Constitution. They follow in the footsteps of Hamilton. The slavery issue was geographic more than ideology. To be accurate through today, you’d have to include the 1960 defection of the Dixie-crats who, like Strom Thurmond and George Wallace left the Democratic Party for the Republican Party completing the shift of racists in the south to the New Republican Party of today. Which is why the south is full of Red States now. The Democratic-Republican Party of Jefferson has no connection to either contemporary party. This article is rubbish. The DP began with Andrew Jackson in 1828 and the RP was formed in 1854. By the time either of them began the Jefferson party was gone. I looked up this article because I questioned claims made in a movie I just saw “Death of a Nation”. Based on this article and the comments with specific references and not just opinion, I have come to the conclusion the movie I saw was completely truthful. Clearly, IH has consumed the kool-aid and believes everything he or she has been told by a liberal. I remember being told the same thing Rebecca said – “today the parties have switched”. But based on the truth of history, and not what has been fabricated for the benefit of the Democratic party, I am relieved to hear that both parties have been true to their roots throughout history. That just makes sense. The whole “switching” things never really made any logical sense, except if you were trying to rewrite the reality of past deeds.